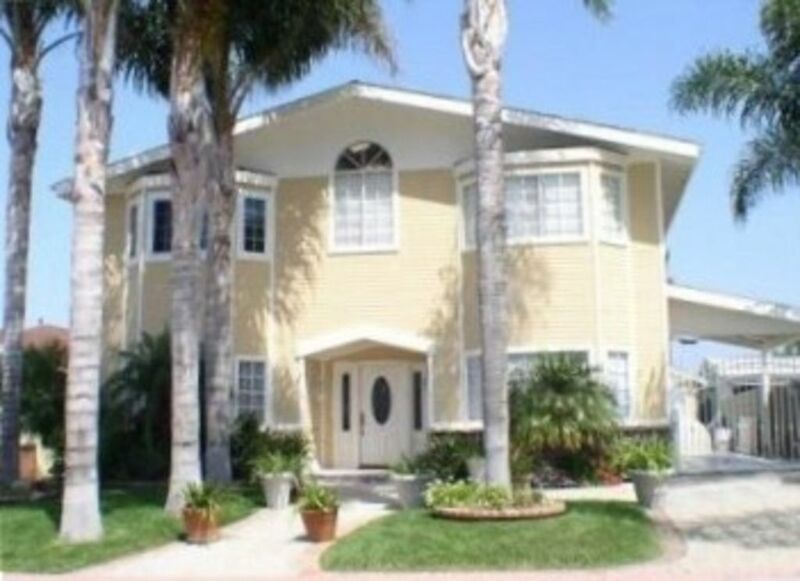 Luxury 5 BR Beach House - Walk to T Street Beach /Downtown. WALK TO THE BEACH! This house is ideally located within 10 minutes walking time to San Clemente's Pier and T Street Beach! The downtown with it's restaurants and shops are also within minutes walking distance. Our gorgeous 4,000 square feet beach house is first class, beautifully appointed and is for the discerning vacationer who appreciates the finer things in life. This home is perfect for vacations , family reunions or other special occasions. The house is decorated in Beach/Tommy Bahama style, with five bedrooms (three upstairs) plus loft room with queen sleeper and three baths and with slate floors, granite counters, cable TV and high speed wireless internet. Imagine sleeping in a huge upstairs master suite and awakening to views of the Pacific Ocean from every window. The fantastic travertine and granite master bath has a tub and separate shower. Also upstairs is the large loft room which is great for relaxing with friends and family and viewing the sunset over the Pacific Ocean. The large loft room has a queen sleeper, desk for your computer, large TV, DVD and video with attached deck with great views of the Pacific Ocean. The deck is especially great for watching beautiful Pacific Ocean sunsets over Catalina Island, taking in the sea air and listening to the waves. Downstairs there is a spacious dining room with an inviting fireplace and with table seating up to 10-12, additional seating in breakfast nook and at kitchen bar. Also downstairs there are two further bedrooms, formal living room with beautiful fireplace (with additional queen sleeper), the large gourmet kitchen with granite counters is great for cooking family dinners with top of the line appliances., a bathroom and utility room with washer and dryer. Outside there is a large patio with barbecue, hot tub, deck and garden with fire pit. There is also an outside shower to clean away all the sand from a day spent at the beach. Similar houses rent for much more! San Clemente is a quaint beach town with fantastic uncrowded and some of the best beaches in the USA, a pier, great restaurants (casual and fine dining), bars, antiques shops, boutiques, and a farmers market! and has the world's finest climate enjoying more than 342 days of sunshine per year. San Clemente is is located about halfway between Los Angeles and San Diego on the southern Orange County Gold Coast and is very close to San Juan Capistrano with it's world-famous Mission. It is convenient to fly into LA, San Diego airports (one hour away) or John Wayne Airport only 35 minutes away. Disney, Knotts Berry Farm, Water Parks, San Diego Wild Animal Park and Zoo, Legoland, etc. are within easy reach of San Clemente. Downtown San Clemente with it's boutique shops and restaurant is 10-15 mins walk or 5 minute drive from property. Great for taking a stroll anytime of the day! Watch our amazing sunsets from our deck and loft room. Owner was very nice but the house is very old and in disrepair. Most vacation rentals included Soap, Shampoo but this one just had near empty hand soap. Great house, size, and location. Some of the kitchen stuff could be updated, but overall great for a family reunion. Very nice house. Plenty of room for everyone. Was able to take some really nice walks. Had a wonderful dinner at the San Clemente Pier. Nice and close to downtown San Clemente. Close enough to walk to downtown and the pier. Wonderful weather. Nice BBQ & HotTub. It was great ! Plenty of room for our family ! Easy walk to beach and stores! We would definitely book it again ! We had a great time. The indoor and outdoor space and layout made it easy to make meals and still be part of the group. There was plenty of space for 5 couples with more than enough plates, glasses, and silverware. We stayed during a heat wave so it was a little uncomfortable with just fans but that was easily resolved by a short walk down to the great beach so close by. The only downside was the kitchen, where we spent a lot of time, was outdated. The microwave didn't work and the utensil drawers were a little sticky to the touch, although the rest of the house was super clean. Overall, it was great for our needs and we would definitely recommend it. Plumbing issues caused a waterfall from the upstairs bathroom to cascade through the living room light fixture on our first night there. After many excuses and multiple intrusions (and the suggestion that there was an outside shower we could use!) on our vacation we got half of the upstairs shower working at the midpoint of our vacation. Being promised that we would be compensated for the inconvenience we gritted our teeth and made it through. After multiple attempts on our part to reach the owner's son we finally contacted the owner, who did at least get her son to contact us... The "compensation" offered was far less than reasonable. For a Very expensive rental that had only 2 fully functional bathrooms instead of 3 for 10 guests. Save yourself the headache, do not rent this property!! Outdoor seating for 12, Firepit area in back yard, Farmers market every Sunday, Concerts on the beach 6pm Thursdays during the summer.